Are you ready? The early teal season is only a week away. All the studies, predictions and population counts are in! The 2010 waterfowl season could be above average. With a little help from the weather, it could be a "great" season. So what is new? Did you know that in Missouri, HSP averages 40,000 acres (185 units) of leased waterfowl properties? Granted, some of these units are farm ponds. But hey, if they are in a flyway, in a picked cornfield, this pond could be a "honey hole." HSP keeps an eye and an ear open for waterfowl properties. There are several farms within easy driving distance from the KC metro area. We have one farm in Kansas (near Oskaloosa) that has a pond with two waterfowl blinds. Deer, turkey, ducks and geese can be pursued from this one farm, not to mention fishing in the pond...I'm purposely not going to print the farm number - searching through our AWA reservation system is quite easy and can be very rewarding. 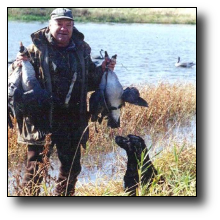 Our famous "Strip Pits" have proven time and time again, it is a duck and goose haven. Every year more and more HSP members "team up" for group hunts and end up having a new "hunting partner." Ponds and corn fields are scattered throughout Jackson, Johnson and other nearby counties. You are missing finding that "honey hole" if you don't do some scouting. We do have a "new" waterfowl lease. (Chariton County, MO-100 Acres) Waterfowl hunting in the heart of North Central Missouri. Take the lane provided and park in front of the White barn. From here you will need to walk to the blind. There will already be 30-40 decoys in the blind for your use so take whatever you need accordingly. The blind is brushed, insulated, and shingled on top. It has an open face along the 24ft front and plenty of room being 16ft deep. It also has dog boxes on both sides of the blind. The land owner, who puts in WRP for the conservation department said it will comfortably fit 10 people. It has a propane heater and a stove for your use. You will need to bring your own propane. Do not use any you may find already there and please be extremely careful. I believe there are 3 separate heaters. You will also need to set and pull decoys each day. To the North there is a Waterfowl property that is commonly used by conservation agents, so abide by the laws and you should have no issues, however I felt that it was necessary to bring this to your attention. The water level ranges from 6 inches to 4ft. with the wetlands consisting of millet and morsel grasses. The upland consists of foxtail and horseweed. It is located half way between Swan Lake and Thomas Hill Reservoir and it holds water all year. In the past, they have taken 500-600 birds a year. It will be available Thur. through Sunday so that it can rest the remaining days. You may also hunt other areas rather than the blind if you so choose, that reservation should be outside the blind. Please coordinate and use common sense if someone is in the blind! Please stay clear of the house that is marked out in red. This type of property is unique to Hunting Sports Plus so please work with us so that the season is successful. Waterfowl is a different type of hunting. We would never ask you to use the same blind deer hunting, but in this case we will be having 2 reservations available for the blind, the North and South. Each reservation can have a maximum of 4 hunters in their party. Therefore the most that could ever be in the spacious blind would be 8. Again, please work with us to evaluate how this will work on this property. Please take extra good care of this property. It's a jewel and we want to keep it in the club for a long time!